Come enjoy an unforgettable day in one of the most beautiful sites in France, Mont-Saint-Michel. At your own pace, amble this pretty town located at the entrance to Brittany, constructed on a rocky isle that has a spectacular view. You will board one of our air conditioned buses at our agency PARISCityVISION, located in the center of Pairs, and take the bus that leaves at 7:15. You will be accompanied by a hostess who will give you all of the information you need to allow you to enjoy this day in total peace of mind. After a trip across the beautiful French countryside, you will arrive at the foot of Mont-Saint-Michel at around 11:45. You will then have lunch in one of the nearby restaurants before taking the shuttle to visit the Mont. 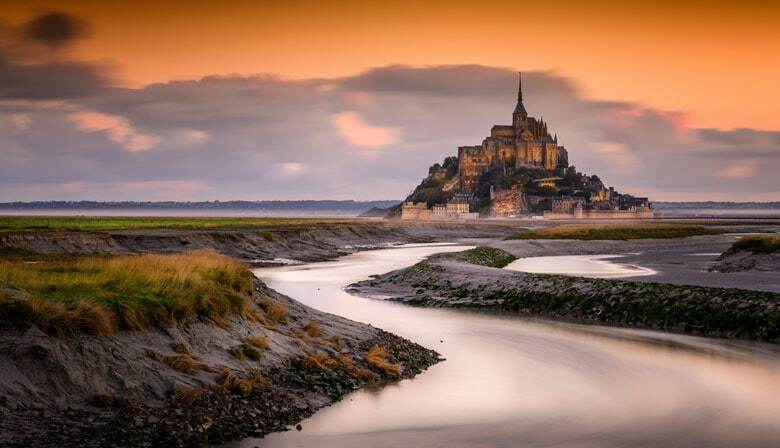 Your afternoon will then be devoted to discovering Mont-Saint-Michel, classified as a world heritage site by UNESCO since 1979. You begin your visit by strolling the picturesque streets to the celebrated Abbey. With your entrance ticket, which will be given to you by your hostess, you will visit, at your own pace, this magnificent Benedictine building dating from the 8th century. Developed in a Gothic style and dedicated to the archangel Saint Michael, the Abbey is home to a superb cloister, suspended between the sky and the sea. The arcades of the galleries are supported by columns in staggered rows, which allow in more light and airiness in. Behind the cloister, you will come to the impressive refectory, where the monks gather for their silent meals. After the visit to the Abbey, be sure to walk through the streets the length of the ramparts, which have a sensational view over the bay. The incredible view, extending over the sand that encircles the rock, will take your breath away. You can also take advantage of your time here to taste some specialties of the Mont (the famous Breton crepes, for example), visit the souvenir shops, attend some village events, and, if time permits, visit some museums. The departure from Mont-Saint-Michel is scheduled for about 4:30, to arrive at our Paris agency at around 9:15. The tour is excellent! ParisCityVision is very organized and it’s clear where the coaches were. The tour guide is friendly, gave informative sharing about the destination prior to reaching the place (most surprisingly, in 4 languages to cater to most of the guests). The tour guide gave time for us to rest on the coach as well given that it was early and we were sleepy and tired. I think everyone Should be able to hear the “tour”/facts given in the bus on the journey there. I didn’t pay for the tour at the destination, but I still would have liked to be somewhat informed. Experience driver, friendly tour guide, clear instructions given. Nice trip, great view. The tour went smoothly! The guides were helpful and clear with their instructions. The bus departed from Paris and arrived back to Paris exactly on time. I thought the mid-drive restroom and snack stops allowed for plenty of time to use the clean restrooms and grab a bite/drink to eat. The time on site at Mont St. Michel was enough to eat and walk through the Abbey and the village. The bus ride was comfortable. Had a great time! Staff are friendly and helpful. The bus is clean and comfortable but riding time is prone to traffic conditions, our trip took more than 5 hours due to two road accidents on the way to Mont St Michel. Tour is ok. The place is magnificent.